We waited for years, planned for months, baked for weeks and fidgeted for days. Then the hour came when the blessing was spoken. We drank champagne and danced until our toes were bruised. My daughter was married last Saturday. My assignment landed with the wedding cake. It had been at least a decade since I’d put together a tiered cake, so a few experiments followed as I pulled up the past. The graduated baking tins were still stacked in the basement, and after a few trials the Swiss meringue buttercream whipped up to meet the groom’s taste. The traditional, tried and true, 1-2-3-4 pale yellow butter cake selected from my twin granddaughters’ birthday cake would be our base. I hoped for lemon or raspberry fillings for summer, but my daughter held out for dark chocolate tempered with a ribbon of caramelized sugar for pure decadence. I blended classic meringue buttercream with a portion of standard American powdered sugar frosting to lighten the richness and lift the sweetness. I hovered over the three, separate 4-layer cakes in my home kitchen where they took over the entire fridge for most of a hot summer’s week, before Barbara drove me and my brood of cakes to Chicago in her air-conditioned station wagon a day before the wedding. 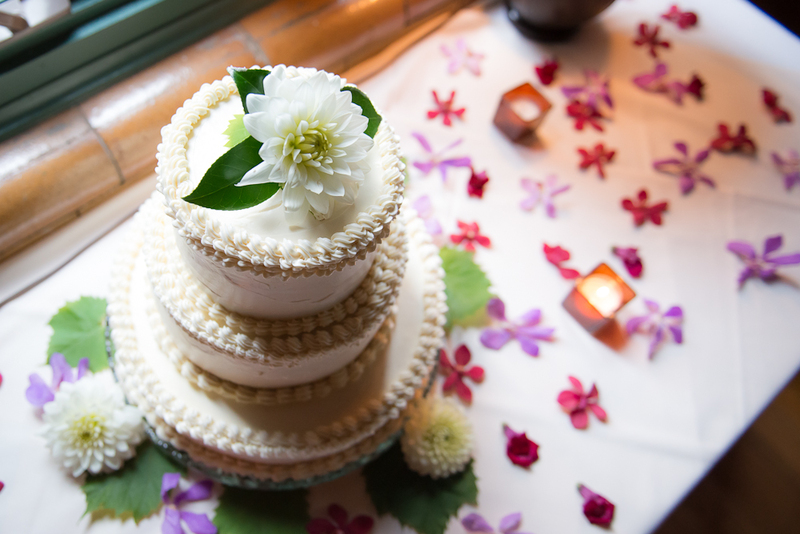 North Pond restaurant graciously allowed me to assemble the confection in their dining room where I lifted my cakes into a dramatic stack, piped icing around the joined edges, and slipped the tower into a packing box, which Greg stowed in the wine cooler. I put the cake into his hands, and it was time to pack for the gala weekend. Here’s the basic recipe for cupcakes, birthday cake, plain cake or even wedding cake. Make sure all ingredients are at room temperature. Generously butter and flour 2 10-inch by 2-inch or 2 8-or 9-inch by 2-inch cake tins. Preheat oven to 350°F. Sift together flour, salt and baking powder; set aside. In deep mixing bowl, cream butter and gradually beat in remaining sugar to form white cream. Add whole eggs one at a time. Add vanilla. Scrape down mixing bowl. On low mixing speed, alternately add flour and liquid (milk + water) in 4 additions to creamed mixture, making sure each addition is thoroughly blended. Beat 5-6 seconds. Remove bowl from mixer. Divide batter evenly into prepared tins and bake in preheated oven 25-35 minutes. When cake is done, it will be golden on top, pulling away from sides of tins, and a toothpick inserted in center will come out clean. Remove from oven, allow to rest 5 minutes, and turn layers out onto cooling rack. Immediately top with another rack, reverse layers, leaving cake upright to cool. You are currently browsing the Mary Jo's Kitchen blog archives for July, 2012.